On September 21, 1944,3, 274, 80, 56 and 486 (RNZAF) Squadrons moved to the Continent, replacing the Mustang III squadrons in 122 Wing. Soon based at Volkel in Holland, the Tempests were used for “armed reconnaissance,” - low level attack, strafing trains and other transport - as well as air superiority, taking on the Luftwaffe frontline fighter units. In February 1945, 222 and 33 Squadrons of 135 Wing converted to the Tempest and were joined by 274 Squadron. 52 German fighters were shot down during December 1944, with 89 trains destroyed, for the loss of 20 Tempests. Following the Operation Bodenplatte of 1 January 1945, 122 Wing bore the brunt of low to medium altitude fighter operations for the 2TAF Tactical Air Force, with Spitfire XIVs of 125 and 126 Wings often providing medium to high altitude cover for the Tempests. The Wing lost 47 pilots in January, 1945. Throughout the period from January to March, 1945, Tempests flew “rat scrambles,” particularly over the Me 262 and Ar 234 base at Rheine-Hopsten, to catch jets that were most vulnerable during take-off and landing. Luftwaffe pilot Hubert Lange said, "The Messerschmitt Me 262's most dangerous opponent was the British Hawker Tempest — extremely fast at low altitudes, highly-maneuverable and heavily-armed." After seven Tempests were lost to flak at Rheine-Hopsten in a single week, the "Rat Scramble" was discontinued. In air-to-air combat, the Tempest units shot down 239 German aircraft between November 1944 and the end of the war, achieving an estimated air combat success ratio of 7:1 while accomplishing a 6:1 ratio against single seat enemy fighters. Donald Charles “Foob” Fairbanks was born in Ithaca, NY, in 1923, the son of a professor at Cornell University, and eventually became the top-scoring Tempest pilot of World War II, flying with the RCAF. Fairbanks became deeply interested in aviation at a young age. When he graduated from high school in 1940, he discovered he could not join any U.S. air force without two years of college, so he ran away from home and joined the RCAF in Hamilton, Canada in February 1941. He was rewarded for the flying ability he demonstrated during his training by an assignment as a flight instructor at 13 Flying Training Squadron until February 1943. 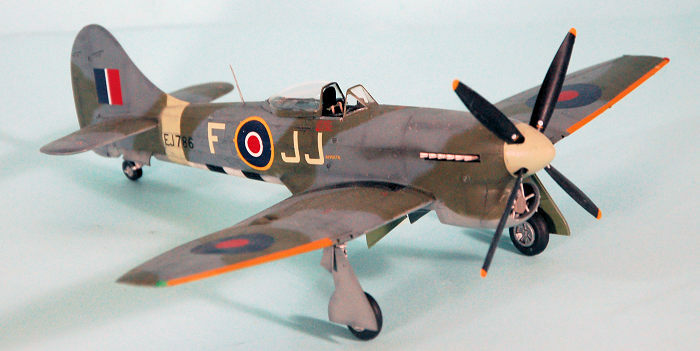 After completion of advanced training in the UK, he joined 501 Squadron on December 1, 1943, flying Spitfires. He refused transfer to the USAAF that spring of 1944, since he would only qualify as a Flight Officer, not to mention the pay in the RCAF was superior to that of the USAAF (the RCAF being the highest-paid air force of the war), and would be most likely be assigned to P-47s. His first victories were scored over Normandy on June 8, 1944, when he shot down one Bf-109 and damaged another near Le Havre. 501 transitioned to the T empest that August, at which time Fairbanks was transferred to 274 Squadron, where he shot down a V-1 on August 29, 1944. The move was fortunate for Fairbanks, since 501 remained in the UK on anti-diver duty against V-1s, while 274 was sent to the Continent in September as part of 122 Wing. Flying Tempest V EJ786, JJ-F, Fairbanks first demonstrated what he was really made of as a pilot on November 19, 1944. During a ground-strafing mission against rail transport, his Tempest was hit by flak in the leading edge of the left wing, which set the fuel tank afire and rolled the Tempest inverted from the impact during the low-level run-in on the target. Flight Leader Warren Peglar called out to find out who had been hit. Fairbanks’ wingman, Jock Malloy, informed Peglar it was Fairbanks and said he would lead him back to base. In the meantime, Fairbanks, still inverted at low level, flew over the target and then recovered, flipping the Tempest upright which put out the fire, and headed for Volkel on his own. By the time the rest of the flight returned, Fairbanks had already become the subject of the famous photograph of him standing next to his badly-burned Tempest, which had lost all the fabric from the rudder (making his recovery from inverted flight all the more amazing for the increased difficulty). On December 17, 1945, again in the now-repaired EJ786, Fairbanks scored his first two Tempest victories, two Bf-109s shot down and a third damaged. A few days later he was transferred to 3 Squadron, still in 122 Wing, where in January he began to run the score that would make him the top Tempest pilot. During January 1945 he scored an Fw-190D-9 and a Bf-109G shot down, one-and-a-half Ju-52s and two Ju-88s destroyed in strafing attacks. On February 9, 1945, by then known as “The Terror of Rheine” for the many combats he fought in the vicinity of the major German airbase at Rheine, he returned to 274 as commanding officer, replacing Squadron Leader Baird who had been shot down in combat with JG 27 the previous day; he was only 21. On February 11, 1945, he claimed one Me-262 shot down and one damaged. The airplane he shot down was actually an Ar-234B-1 (Wk.Nr. 140149) coded "4U+DH" of 1. (F)/123 flown by Hans Felder; Fairbanks was the first to shoot down one of these aircraft. In four other combats over the rest of the month, he shot down two mo re Bf-109s and four Fw-190D-9s. On February 28, returning with five other Tempests from a train-busting mission, he led an attack on over 40 Fw-190D-9s and Bf-109Ks of JG 26 he spotted forming up over the Black Forest. After a hard fight he was finally shoot down by by Feldwebel Karl-Georg Genth of 12./JG 26 in Fw 190D-9, “Gelbe 15,” and was immediately captured, avoiding a lynch mob of German civilians when a German officer intervened. He spent the rest of the war as a POW, during which he was awarded a bar to his DFC. Returning from captivity, he claimed to have shot down a final Fw0190D-9, though this was never officially credited; however, Luftwaffe casualty records do show a loss at the correct time and place, a Fw-190D-9 of 9./JG 26, “Weiss 17,” flown by Unteroffizier Franz Schmidt. Returning to home after the war, Fairbanks obtained a degree in engineering from Cornell and then went to work for Sperry Gyroscopes in Ontario. He also flew Vampires and T-33s with the local RCAF Auxiliary Air Force unit, as well as spending two years in the UK, where he was able to fly Meteors with 504 Squadron, RAuxAF. In 1955, he returned to Canada to take a position as a test pilot at deHavilland Canada where he worked with former RCAF Spitfire pilot Jerry Billings, testing the Beaver, Otter and Caribou. At Avro Canada he became an expert in STOL flight. He died a natural death at the early age of 52 in 1975. His score of one V-1, 11 aerial victories and four ground victories in the Tempest made him the top Tempest pilot of the war. This is the second release of Eduard’s new-production Tempest V. The Tempest V Series 2 differs visually from the Series 1 in that it is equipped with short-barrel cannon that do not extend beyond the wing’s leading edge. The kit includes a new spinner, and new detail in the radiator. 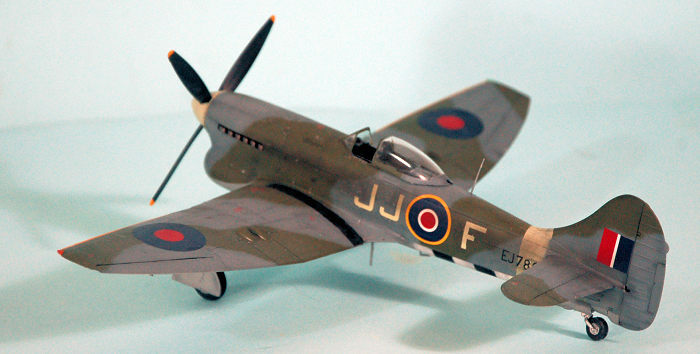 It includes decals for six aircraft; interestingly, the markings for the top-scoring Tempest pilot are not included. Having learned from the first kit what I think is a more successful way to construct the kit, I am including here my remarks from that review. I followed these instructions and had a very successful result. This kit maintains the Eduard reputation for being “fiddly,” and care must be taken throughout the construction to insure all sprue nibs and any minor flash are cleaned off the parts, since they fit very precisely. That said, the end result is worth the extra effort taken during construction. I found that following Eduard’s construction sequence made the process far more difficult than it needed to be. The atmosphere over the workbench was frequently a deep royal purple with thunder rolling and lightning bolts flashing, as I discovered yet another place where following the instructions made things harder than they had to be. As a result, I am going to outline here in detail an alternative method of construction. I am already using this hard-won knowledge on a second kit, and things are working much easier. The fit of parts is really tight, in fact in some places, too tight for most of us to get it properly assembled in a traditional method. Also, there are a lot of small parts on the sprues, and they have really delicate sprue gates attaching them to the sprue. It is very easy to knock one off unnoticed while cutting another part off the sprue, with that small part disappearing forever, to drive you nuts when you come to the point in the instructions where you are directed to attach it. “Where the @#$##@!! is it? !” you will be crying. HANDLE THESE SPRUES WITH EXTREME CARE. First, the edges of the parts for the radiator assembly, the fore and aft bulkheads of the cockpit assembly (assuming you are using the kit parts), and the wings need to be scraped a bit (the way I have suggested you scrape the area where the wing cannon cover fits to the fuselage in the new Fw-190). Not a lot, but a bit. You also must make absolutely certain you do not paint any of the mating surfaces of the major sub-assemblies because that will affect the assembly. As regards the cockpit: I suggest you use the plastic instrument panel assembly with decals; it will ultimately fit better than the photo-etch pieces when it comes to shoehorning that instrument panel into the fuselage. Additionally, if you do not use all the photo-etch levers, you will not miss anything; almost all the detail parts will not be visible in the cockpit once assembled. Now, regarding the fuselage sub-assembly: trim the radiator housing parts and be very careful that you attach them to the fuselage half in the grooves that are there for attachment. If you don’t do this, the forward fuselage will have trouble getting squeezed together tight enough for a good joint on the centerline. I suggest you assemble the fuselage before inserting the cockpit assembly. This will allow you to get the part with the fuselage opening properly positioned by working it from inside and outside; pressing it in from outside, as Eduard suggests, will make a good joint with no gaps difficult to achieve. If you cut off the little locating pins on the outside of the cockpit assembly, it is easy to pop it into the fuselage and slide it into position. With the fuselage assembled and the joints set up, there will be no problems associated with later assembly after you get the cockpit into position. The final difficult bit is the wing sub-assembly. When you assemble the parts of the wheel well into the upper wing, DO NOT attach part E79 (the inner gear door retraction mechanism) to Part E48 (the inner gear well bulkhead) as the instructions would have you do. Save that part and attach it with tweezers (it’s easy) once you are at final assembly and putting the landing gear and doors into position. Otherwise, you are guaranteed to knock off the retraction mechanism. Also, go through the instructions and find all the parts that should be attached inside the wells and do them now. DO NOT WAIT till you come across that instruction later - you’ll likely have knocked the part off the sprue by then. Now comes attaching the wing sub-assembly to the fuselage. DO NOT fully assemble the upper wing parts to the lower wing before doing this, because that will require you to bend the wing to pop the upper wings into the fuselage to get the large tab inserted correctly. Instead, attach the lower wing to the fuselage, and work the joint from inside and out to get everything fore and aft smooth. Let that then set up so those fore and aft joints are really solid. Then take the upper wing, insert the tab into the fuselage, then position the upper wing. Once you have run glue around the joint, use rubber bands to squeeze the parts fore and aft, so that joint between the upper and lower parts that runs along a panel line through the flaps; you want to squeeze that joint together tight. Do not glue the upper wing to the fuselage until you have glued the upper and lower wings. Once you run glue along the wing-fuselage joint, use a strong rubber band run around from wingtip to wingtip, to squeeze the wing against the fuselage and get a good solid joint. If you do all this with the fuselage and wing sub-assemblies, you won’t have to use any gap filler, and you won’t lose any of that beautiful surface detail. If you do it the way Eduard tells you, you will have to use joint filler along the fuselage centerline, the fore and aft wing-fuselage lower joints and the upper wing-fuselage joint, which you will then have to sand down, losing that great surface detail and if you don’t have a nice little pounce wheel like I do, you will be SOL to get that detail back. The horizontal stabilizers and the control surfaces are easy. Assemble as they fit. Fortunately, this model does not involve applying the full D-Day invasion stripes, as did the first model. I painted and masked off the black/white invasion stripes under the rear fuselage, then painted the Sky band which was also masked off, as well as painting the spinner Sky. I used Tamiya’s XF-81 RAF Dark Green, XF-82 RAF Ocean Grey, and XF-83 Sea Grey Medium. The camouflage scheme was freehanded using the diagrams in the markings section of the kit instructions. 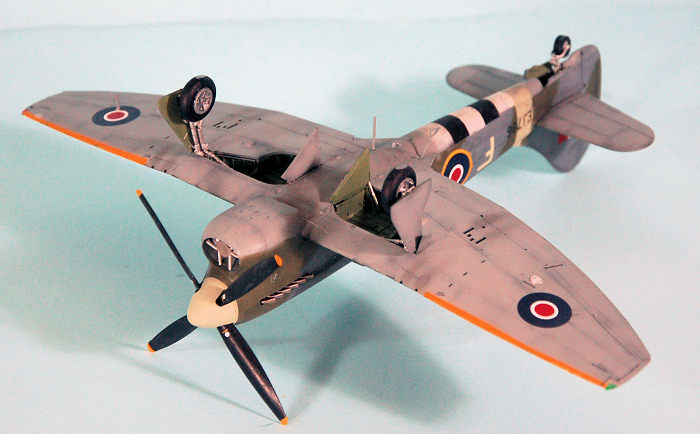 I used decals from the dungeon for the individual aircraft squadron markings and serial number. Interestingly, during my research, I ran across the only photo I have ever seen of a 274 Squadron Tempest, from the right side of the airplane. Everyone, including all aftermarket decal makers, have assumed that 274 Squadron, like the other squadrons in 122 Wing other than 486 Squadron, had their squadron markings with the squadron code to the left of the national insignia and the individual aircraft code to the right, on both sides of the airplane. Wrong! 274 Squadron, along with 486, had the squadron codes forward of the insignia on both sides, with the individual aircraft code to the rear. Thus, the markings as I have them here are correct for 274 Squadron aircraft if you choose to use any of the aftermarket decals for this unit. I gave the model a coat of clear gloss, followed by two coats of clear flat. I then attached the gear door retraction mechanism for the inner doors in the wheel well, attached the landing gear and doors, and unmasked the canopy, which I posed in the open position. To me, this second kit confirms my belief that Eduard’s 1/48 Tempest is the best kit of this aircraft available in any scale. I hope they will go on and do a Tempest II. As stated above, it is a fiddly kit to construct, but the result is well worth all the effort expended. Recommended for experienced modelers.